When kept clean, a vinyl fence retains its beauty and lasts longer! Vinyl is one of the most popular fencing options out there for homeowners. This popularity is thanks to the durability, versatility, style, and low-maintenance qualities of vinyl fences. 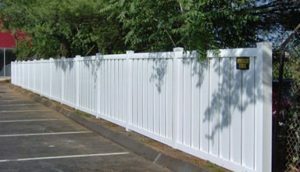 Since they will not rot or warp like wooden fences and don’t require the rust-proofing of metal fencing material, vinyl makes a great choice for homeowners looking for the peace of mind of a low-maintenance fence. But even a low maintenance fence will need some TLC now and then–especially if you’ve chosen to go with the classic white picket fence style. Vinyl can get dirty and dingy throughout the year, especially with the use your lawn gets through the summer season. But with the right care, you can keep your vinyl fence looking brand new year-round. Here’s how to keep a vinyl fence clean all summer long. The first step to cleaning your vinyl fence is to simply spray it down with a hose. Your garden hose should be able to remove loose dirt or other debris that has built up on the surface of the fence throughout the season. If surface stains are still present, try using a high-pressure nozzle to spray the stains away. After spraying down your fence, a basic cleaning solution can do the trick for slightly tougher staining. By mixing a small amount of dish soap with warm water in a bucket, you can create a simple, sudsy cleaner that usually does the trick for your vinyl fence. Use an old dishcloth or sponge to really work at the stains. If a simple cleaning solution hasn’t done the trick, you can always use a bleach solution to clean and brighten up your vinyl fence. Be sure to mix one part of bleach into at least 5 parts of water and use rubber gloves to safely bleach your fence. For the most difficult stains, you may find that bleach doesn’t quite do the job. Iron and mold, in particular, can be stubborn on your vinyl fence. But for these jobs, there are specialized cleaners that can help. Overall, keep your fence well-prepped with anti-mold coating and frequent cleanings to keep your fence looking clean and new all summer long. No matter what type of fence you have decided on, Hercules Fences has the expertise and equipment to construct your dream fence. Our experienced team can help meet your fencing needs, whether they are residential or commercial, for the right price. We proudly serve Albemarle County, Amelia, Ashland, Augusta, Buckingham, Caroline, Charles City, Charlottesville, Chester County, Chesterfield County, Colonial Heights, Cumberland County, Dinwiddie County, Fluvanna County, and Fort Lee, Virginia, VA. Give us a call at 804-752-7992 or visit us online. To see examples of our work and keep in touch, don’t forget to follow us on Facebook, Twitter, Google+, LinkedIn, Flickr, and Pinterest. This entry was posted on Friday, April 12th, 2019 at 10:45 am. Both comments and pings are currently closed.